Financing your next new car or used car should not be a time-consuming hassle! Let our online auto finance application reduce the amount of time you need to spend on auto loan hunting. Sitting around waiting for a finance approval at a dealership is stressful! So apply for an auto loan approval before arriving at our greater Taylor Chrysler, Dodge, Jeep, and RAM dealership. Nyle Maxwell CDJR of Taylor offers great rates on car loans in the Taylor area (based on credit approval) and can investigate financing options for different credit situations. Our goal is to get you qualified for an auto loan for your new Chrysler, Dodge, Jeep, and RAM, or used cars at an affordable rate. Special financing is not only for buyers with bad credit. Self-employed or commissioned employees may be classified as high risk and our auto financing services can investigate options for people who are classified as such. Are you looking to lease a Chrysler, Dodge, Jeep or RAM near Pflugerville, Round Rock, Hutto, Cedar Park or Georgetown, TX? You’re at the right place! Our auto finance experts work tirelessly, and it is our goal to ensure you receive low rates on your car lease in Taylor. Stop by our dealership for Chrysler, Dodge, Jeep and Ram lease specials or give us a call! 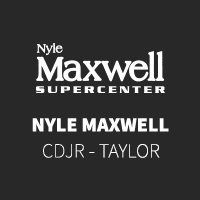 Give the Nyle Maxwell CDJR of Taylor finance team a call, or visit us at 14150 US-79, Taylor, TX. You can also contact us by filling out our contact form below. We look forward to serving your Texas auto financing needs. Get a jump on it by checking out our Payment Estimator, even if you have bad credit!